Editor Frank Scott (FS) from DesignPRWire has interviewed designer JosuÉ Rivera GandÍa (JRG) for A’ Design Award and Competition. You can access the full profile of JosuÉ Rivera GandÍa by clicking here. JRG: My major influence has been my family, an unconditional self-taught mother and an exigent, crafty mathematician for a father. Although, studying architecture allowed me to surround myself among passionate and proud faculty. JRG: LOA Design is a recently established studio. Even though we have multiple design objects in our drafting tables we decided to produce LOA Coffee Cup as a starter. JRG: The materialization of the surrounding context through the process of inquiry and exploration, armed with a high sense of optimism to achieve it. JRG: Definitely a Church. Suggestive objects that allow me to meditate about them and what I do with them. In short, all objects that make me question and edit my convictions. JRG: Locally, in Puerto Rico, the works of Architect José Javier Toro and the furniture designs of Francisco Gutiérrez; mostly their attention to details. And outside of Puerto Rico, the work of the firm and Madridejos Sancho, and also should mention the work of Aires Mateus. JRG: My first design was an steel gate for a local architectural firm, Rigau & Penabad. JRG: My favorite platform / technology are Smart phones. JRG: During late night silences. JRG: The multiple effects of light. JRG: I become exited as a child, an infant. JRG: Throughout the creative process I experience a state of profound sadness that is radically dispersed by an extreme happiness brought by the designed product itself. I enjoy both feelings. JRG: I believe that design success is relative, but I think that when design inspires or motivate others it becomes successful. JRG: I consider its use, imagery and context. JRG: Technology and immediate access to information are - and will continue to be - catalytic for new possibilities. JRG: Last was a collective exhibition sponsored by Ketel One at a local art gallery in San Juan. JRG: It comes most definitely from the works of local architect and ceramist Jaime Suárez. JRG: Would have to say contemporary, but my main approach is through form explorations and proportions as well as how well light performs with the design objects instead of mere functionality. JRG: I live in Puerto Rico, a Caribbean island of strong contrasts, textures and diverse natural landscapes. Thus, in my work local context informs but does not limits. JRG: I haven't got the opportunity to work with companies. JRG: To pay special attention to the designer's work. JRG: Every design object is particular, and its way to approach it differs but through research and the involvement of the client/user becomes - most of the times - the common denominator in our design process. JRG: I live in a Late Modern apartment building so I have to say the space itself. Inside it, a stair, a chair, and of course my coffee cup. 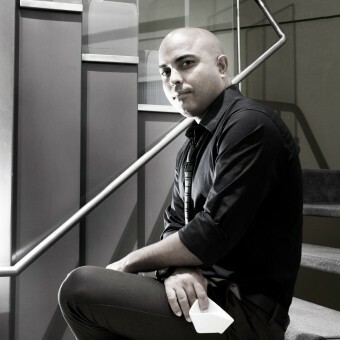 JRG: I spend my days teaching 1st an 2nd year architectural design studios at Polytechnic University of Puerto Rico and my professional practice at LOA Design. JRG: To question everything around you. JRG: I would have to quote Rafael Moneo, "I am most grateful to Architecture for allowing me to see life through its eyes". The positive; being able to be positive in a quite pessimistic environment. The negative; the responsibility of keeping your feet on the ground when dealing with situations of extreme optimism. JRG: Being emotionally moved by what is being designed. JRG: Be passionate and constantly dissatisfied and critical of design responses through the process. JRG: I mostly rely on drawings, technical and sketch. But use many of the current available design softwares. JRG: It's definitely the most difficult tasks. Sometimes quite effectively and other cases with overtime. JRG: Depends but always as stipulated in the contract or agreement. JRG: What are my references? JRG: Staff Designer in the office of architect Luis Flores Architects. JRG: Banco Popular de Puerto Rico, LU/CA, Pure Soul, Colaito y Desquicio. JRG: Simultaneous to the architecture continue to work with other utilitarian objects. JRG: Always! I have a group of friends and colleagues very demanding critics. JRG: I am very happy with the opportunity to participate in A Design Award and to represent Puerto Rico in a competition in this category. I hope to encourage other young designers to participate. Press Members: Register and login to request a custom interview with JosuÉ Rivera GandÍa.